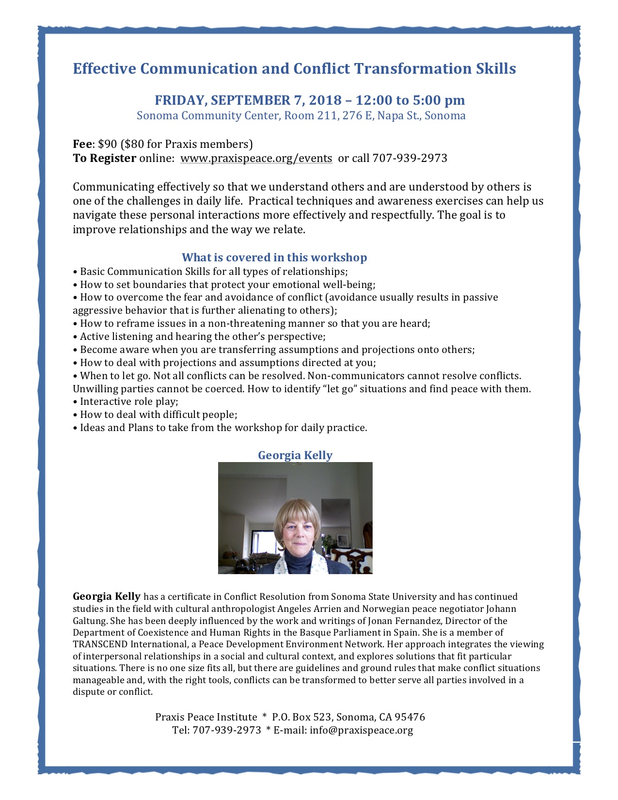 Navigating relationships, disagreements, or just communicating so that we understand others and are understood by others are some of the challenges we face on a daily basis. Practical techniques and awareness exercises can help us navigate these situations effectively and respectfully. When to let go. Not all conflicts can be resolved. Non-communicators cannot resolve conflicts. Unwilling parties cannot be coerced. How to identify “let go” situations and find peace with them. Ideas and Plans to take from the workshop for daily practice. 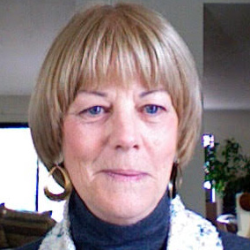 Georgia Kelly has a certificate in Conflict Resolution from Sonoma State University and has continued studies in the field with cultural anthropologist Angeles Arrien and Norwegian peace negotiator Johann Galtung. She has been deeply influenced by the work and writings of Jonan Fernandez, Director of the Department of Coexistence and Human Rights in the Basque Parliament in Spain. She is a member of TRANSCEND International, a Peace Development Environment Network. Her approach integrates the viewing of interpersonal relationships in a social and cultural context, and explores solutions that fit particular situations. There is no one size fits all, but there are guidelines and ground rules that make conflict situations manageable and, with the right tools, conflicts can be transformed to better serve all parties involved in a dispute or conflict.